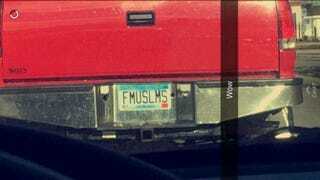 A vanity license in Minnesota has been confiscated and officials are apologizing after the plate, which read, “FMUSLMS,” caused an uproar, Reuters reports. Officials said Wednesday that approval procedures for the vanity plates are under review. The contention started after a St. Cloud-area resident uploaded a photo of the offensive license plate on social media. Gov. Mark Dayton said he was “appalled” that such a license was issued in Minnesota and ordered the Department of Public Safety to confiscate it and to look into the approval procedures for the plates. “It is offensive, and the person who requested it should be ashamed. That prejudice has no place in Minnesota,” Dayton said in a statement issued Monday, Reuters notes. The owner of the plate had listed other choices such as “PETALOL” and “8SLUGTHG,” saying that they were all names of musical bands to which he belonged, Reuters reports. “We continue to review the process for approving personalized license plates,” Minnesota Public Safety spokesman Bruce Gordon said Wednesday, according to Reuters.